In a famous 1963 experiment at Yale University, psychologist Stanley Milgram learned that people’s duty to authority runs pretty dang deep. Here’s how he conducted the study. Two participants met and were placed in separate rooms. One participant was the “learner,” and one was the “teacher.” Unbeknownst to the “teacher,” the “learner” was an actor. The teacher was instructed to ask the learner a question. If the learner got the question wrong, the teacher was directed to shock the student. And here’s the disturbing part. When a “researcher” wearing a grey lab coat told the teacher to keep shocking — even if the student was screaming, kicking, and begging for mercy from the adjacent room — the teacher would continue to shock 65 percent of the time. All the way up to 450 volts of electricity. On the other hand, when there was no encouragement from the researcher, the teacher would quit delivering the shocks early on. Keep in mind these were typical, healthy people — just like you and me — shocking the daylights out of strangers. Of course, no electrical shocks were actually given. But the teachers didn’t know that. It seems our sense of duty to authority does run pretty dang deep. Fortunately, we are content marketers around here, so we deliver products and services, not electrical shocks. But does authority have anything to do with people trusting you when money is involved? That’s exactly what we’ll explore in this post. In other words, telling people you are a world-class copywriter does not have the same effect as showing people that is the case. Take someone like Joanna Wiebe, for example. Joanna got her start in the copywriting world while working at Intuit. While with the company, she was known for digging into the results of campaigns to inform her new ideas. She regularly adjusted copy to make it perform better. Eventually, she struck out on her own with Copyhackers, where she established her authority by publishing a number of case studies. This led to a series of ebooks focused on copywriting. These data-driven articles and ebooks demonstrated that Joanna knew what she was talking about. And it wasn’t long before organizations were asking her to speak at their events (like ours). Joanna didn’t need to say she’s a world-class copywriter. She demonstrated it. If you examine Joanna’s content, you’ll realize that the goal behind Authority content is ultimately about empowering your audience. You give them what they need to know in order to succeed, making them the rock stars, as opposed to a lot of chest-thumping about your business, your clients, or your organization. While Brian was an effective copywriter long before he launched Copyblogger, he never once said that he was. He simply demonstrated it through his content. Brian would write posts as if they were mini chapters in a section of a book. The first series he wrote was Copywriting 101. This was just his standard two-times-a-week content. It took Brian five weeks to get that 10-part series out. But once he was done, he bundled all of those articles into a cornerstone content page. Back then (2006), it was rare to see content organized that way. Not only was it authoritative, it was new, too. What happened as a result of packaging that copywriting content in an authoritative way? People found it. They shared it. They linked to it. Fast-forward many years and content bundles are now common. That means it’s not enough to just create authoritative articles and landing pages. You’ve got to up the value to get attention. And that’s what we did a few years ago. Over the years, Brian and Sonia Simone had created a handful of these series. In 2013, they were edited and formatted into PDF ebooks, and then offered behind a gateway or “free paywall” — what we call a content library. We made them available as a comprehensive content marketing library and created the My.Copyblogger free membership community where you access the content. You don’t have to pay any money. You just register for the site, give us your name and email, and we give you all that good stuff. The cornerstone content evolved into a more appealing and more convenient format behind a free gateway. It was a new concept to the content marketing world. Write a series. Break down your topic into five articles. Think of these five articles as chapters in a book. Publish one article from this series each week. Incorporate elements of Attraction content. You may need to include surveys, stats, lists, and downloadable assets. Promote the series. Share the series on social media sites, link to it in your blog posts and guest posts you write on other sites, and notify your email list subscribers. 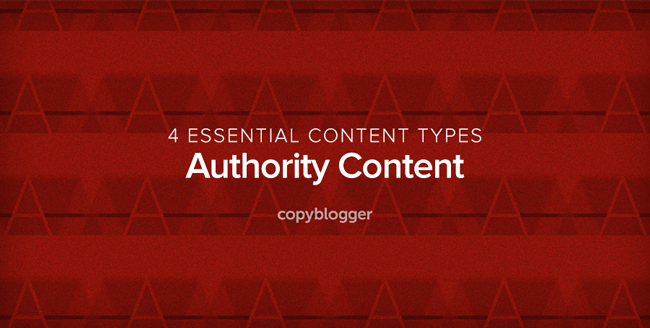 Again, the four content types may overlap, but Authority content will get people to actually do business with you. 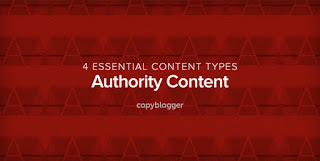 Authority content is the type of content that’s going to be the most likely to attract high-quality links to your site — both links from other websites and, even more importantly, authoritative sites (like popular media publishers, Wikipedia, or government sites). When you combine Authority content with Attraction content, you’ve got an incredible one-two punch. Authority plus Attraction is where the heavy-duty value begins. It tends to attract links and get a lot of shares. This is because — as I showed you in this article’s introduction — authority is one of the most powerful psychological influencers out there. And what’s really cool is you’re helping people, not tricking them. Authority content gets attention, yes. But it gets it in a very meaningful way that’s going to eventually translate into action (which we’ll explain in the last article in this series). Furthermore, people trust authorities, particularly authorities they like, which leads us to Affinity content (the content type we’ll discuss tomorrow). Do you have any questions about Authority content? Drop your thoughts or questions in the comments section below. And let us know about your favorite piece of Authority content (whether or not it was something you created). While you’re at it, let us know who your favorite authority is.